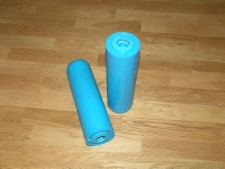 De Ionising filters, Complete Filtration Solutions Ltd. Complete FIltration can supply the Liquapure DI(MB400) cartridge for the reduction or removal of scale forming magnesium and calcium ions from water. The cation / anion media used in these cartridges can also remove or reduce all scale forming salts making this ideal for providing water for chemical and photographic laboratories, steam irons, battery top up, cleaning water for windows and glassware, and hospitals. The cartridges are available to fit in a standard 10 inch and 20 inch filter housing making installation and replacement easy. A 20 inch filter will ideally run at a maximum of 2.2 litre/minute for optimum efficiency and have a capacity of 58,000 mg of TDS(Total Dissolved Solids). For higher flowrates we can offer multi round housings making a resin change easy and clean. A 10 cartridge housing will offer a flow of 22 ltr/min etc. The CFS Liquapure C100E is a high purity premium grade bead form conventional gel polystyrene sulfonate cation exchange resin designed expressly for the treatment of foodstuffs, beverages, potable waters, and water used in the processing of food. Its specification is such that it will exceed the relevant EEC requirements, and the resin is in compliance with the U.S. Food & Drug Administration Code of Federal Regulations section 21, paragraph 173.25; for use in the treatment of foods for human consumption. Its high bead integrity, excellent chemical and physical stability, and very low extractibles content play a large part in its successful employment in these areas.